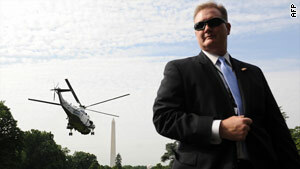 A Secret Service agent stands guard at the White House. A source says the agency may take on air marshal duties. Washington (CNN) -- The federal government is scrambling to find ways to comply with President Obama's order to put more air marshals on flights after a botched Christmas Day airline terrorist attack, government sources have told CNN. Hundreds of additional marshals could be "loaned" from the Secret Service and U.S. Customs and Border Protection, a U.S. official briefed on the investigation said. Another source said marshals could be drawn from Immigration and Customs Enforcement. Additional federal air marshals are needed for high-priority international flights, with other law enforcement personnel filling in on key domestic flights, another source noted. There are already believed to be thousands of air marshals, though exact figures have not been made public. "There are discussions within [Department of Homeland Security] law enforcement agencies about adding to the capacity of the Federal Air Marshal program," a homeland security official said. Internal notices issued Monday and Wednesday by the Department of Homeland Security ask employees to step up to train as air marshals and to serve at U.S. diplomatic posts abroad. Obama said Tuesday that he had ordered "concrete steps to protect the American people, new screening and security for all flights, domestic and international, more explosive detection teams at airports, more air marshals on flights and deepening cooperation with international partners." Some immigration agents have been previously trained to be air marshals in emergencies. CNN's Abbie Boudreau, Deborah Fayerick, Jeanne Meserve and Scott Zamost contributed to this report.